I took a trip to Los Angeles on Saturday to do some research at the downtown library. I snapped some shots as I walked about the richly historic downtown.Â Here’s the Loew’s State Theatre, 1921, 703 S. Broadway. The red brick and terracotta building is slated for adaptive reuse for residential lofts. 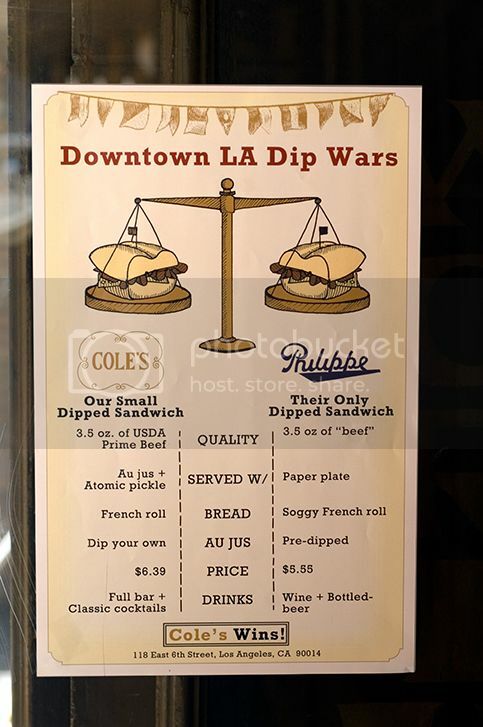 A highlight of the day was lunch at Coles for French Dip sandwiches. 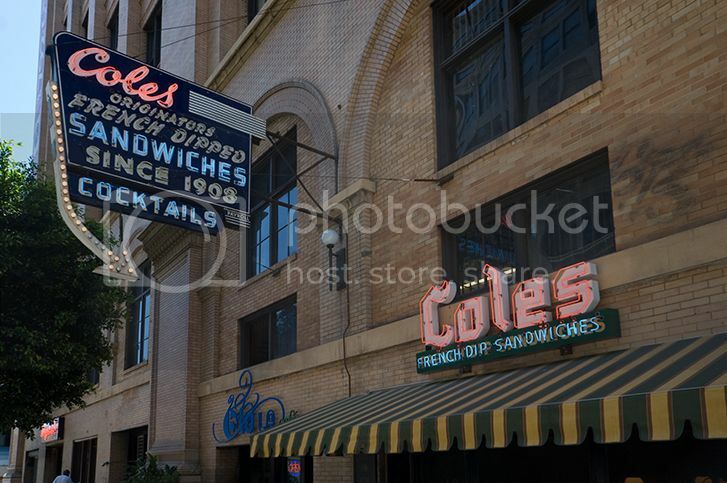 I’m a big fan of Philippe’s but Cole’s is great too.Â Coles with its selection of draft beers and table service is something to look forward to. 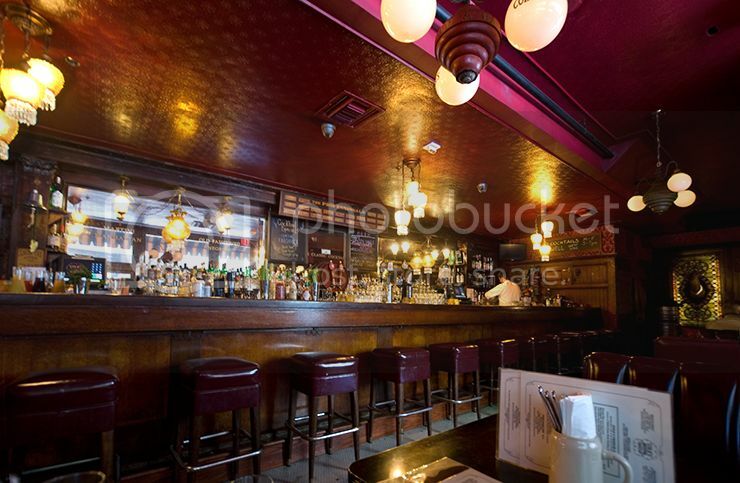 The wood interior and comfortable red booths provide a great atmosphere. The Palace Theatre, 1911, 630 S. Broadway. It was the third home of the Orpheum vaudeville circuit in Los Angeles. 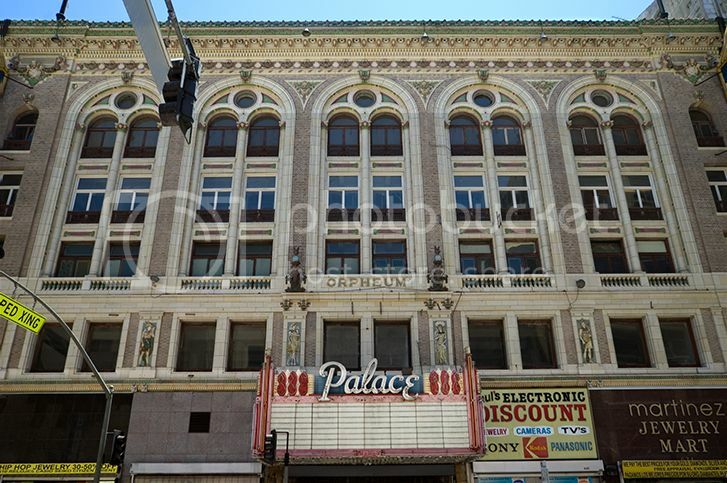 It is now the oldest remaining original Orpheum theatre in the country. The greatest singers, dancers, comedians, acrobats, and animal acts in vaudeville performed here for fifteen years, until the Orpheum moved to its fourth and final location at Ninth Street and Broadway in 1926. G. Albert Lansburgh, who designed both the 1911 and 1926 Orpheum Theatres, was one of the principal theatre designers in the west between 1909 and 1930. In addition to commissions in Chicago, Kansas City, St. Louis and New Orleans, his works included the Warner Bros. Theatre Building in Hollywood (1927), and the interiors of the local Wiltern and El Capitan theatres. Loosely styled after a Florentine early Renaissance palazzo, the faÃ§ade features multicolored terra-cotta swags, flowers, fairies, and theatrical masks illustrating the spirit of entertainment. Four panels depicting the muses of vaudeville – Song, Dance, Music, and Drama – were sculpted by noted Spanish sculptor Domingo Mora. While the structure’s exterior displays Italian influences, its interior decoration is distinctly French, with garland-draped columns and a color scheme of pale pastels. The theatre currently operates as a rental facility for special events and location filming. I took a ride on the 1901 Angels Flight, the”World’s Shortest Railway.” It was built to move residents of the fashionable Victorian neighborhood, Bunker Hill, to the downtown flat land below. Its creator was an engineer Col. James Ward Eddy. He was also Civil War hero and a friend of Abraham Lincoln’s. 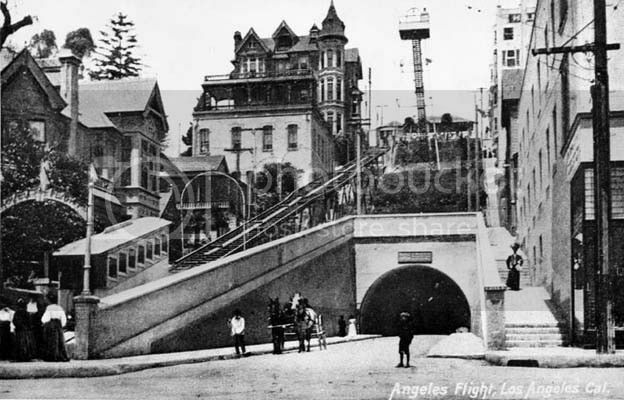 Angels Flight at its original location, 1905. Photo Wikipedia Commons. Angels flight first faced demolition in 1935, but Angelenos protested and it was saved. However the railway was closed in 1969 when the Bunker Hill area underwent horrible redevelopment which destroyed and displaced a community of almost 22,000 working-class families renting rooms in architecturally significant buildings, to a modern mixed-use district of high-rise commercial buildings and modern apartment and condominium complexes which imposed an extremely inappropriateÂ design in what historically had been neighborhood of rich character. Note the great architecture in the photo. All demolished. Angels Flight was reconstructed at 351 S. Hill Street, a half block away from its original site, and reopened in 1996. Sadly it closed once more in 2000 after an accident killed a passenger. But only a short time ago, in March, 2010,Â Angelenos and visitors once again were able to utilize and enjoy the ride on this historic funicular railroad. Angel Flight’s hydraulic system was re-engineered. The fare is Â¢25 each way–or as they would say in the old days “two bits,” to denote a quarter of a dollar. A view from the top of Angel’s Flight. That’s the Continental Building, 1903, located at 408 S. Spring Street. 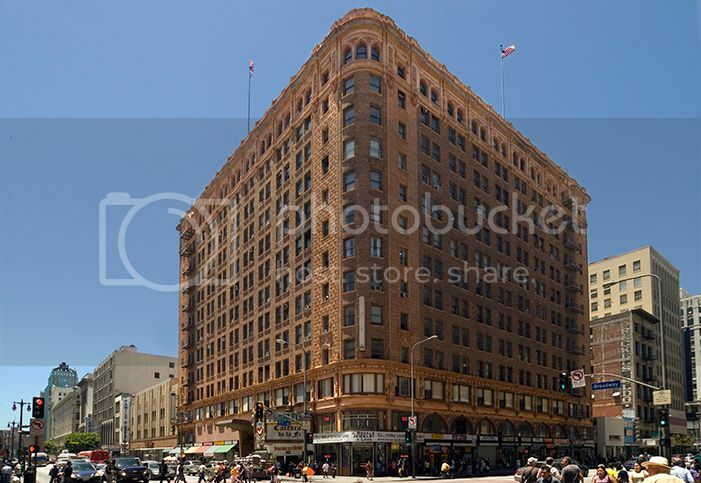 It was the first skyscraper built in Los Angeles. 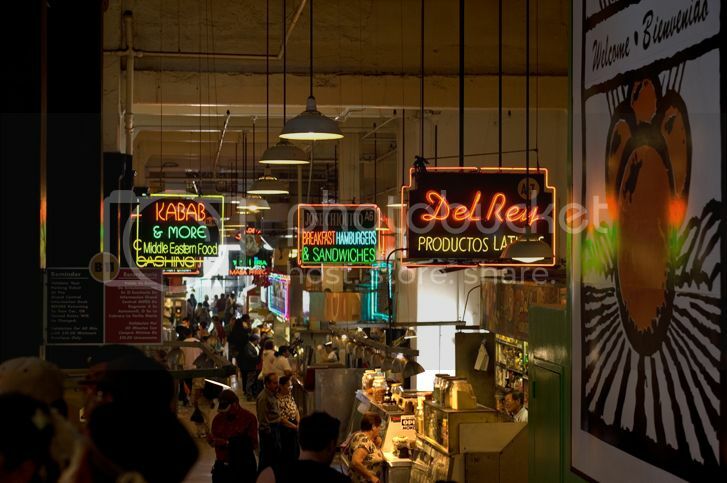 For residents of Bunker Hill, Angels Flight was an important link to Grand Central Market, 317 S. Broadway, which opened in 1917. This view shows only a little of the neon displayed here. 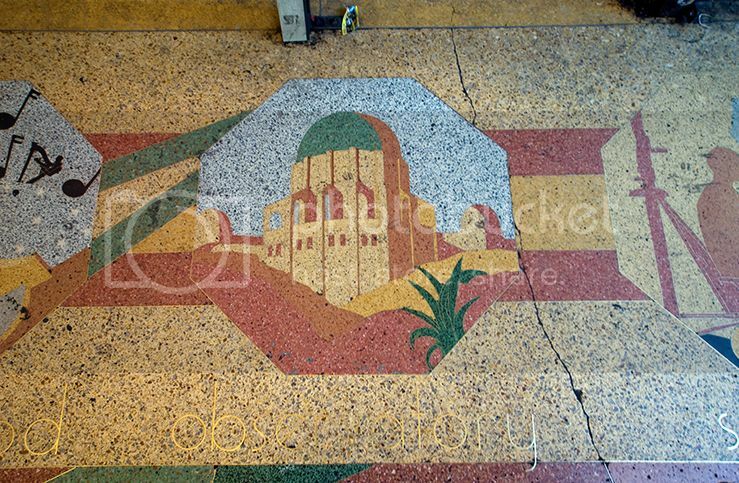 Clifton’s Cafeteria terrazzo. One of the most ornate terrazzos you’ll ever see. 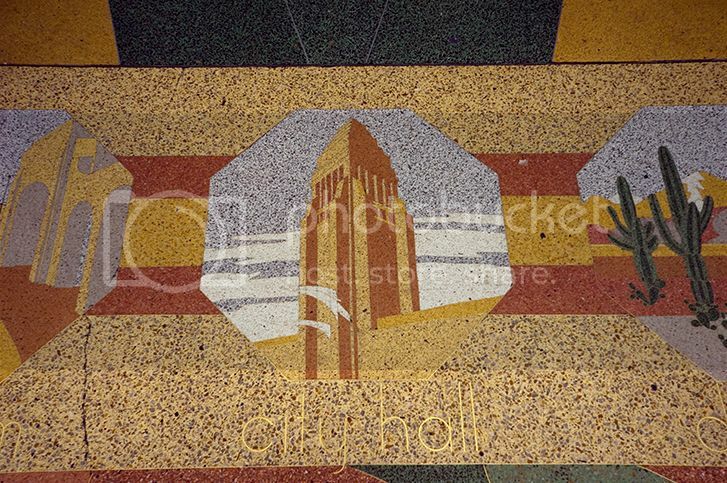 Numerous panels depict defining Los Angeles sites. Clifton’s Cafeteria is located at 648 S. Broadway. The interior is a unique wilderness wonderland with waterfall, stream and a forest chapel with a neon cross. And the food is good! The Eastern Columbia Building, 1929, at 849 S. Broadway. 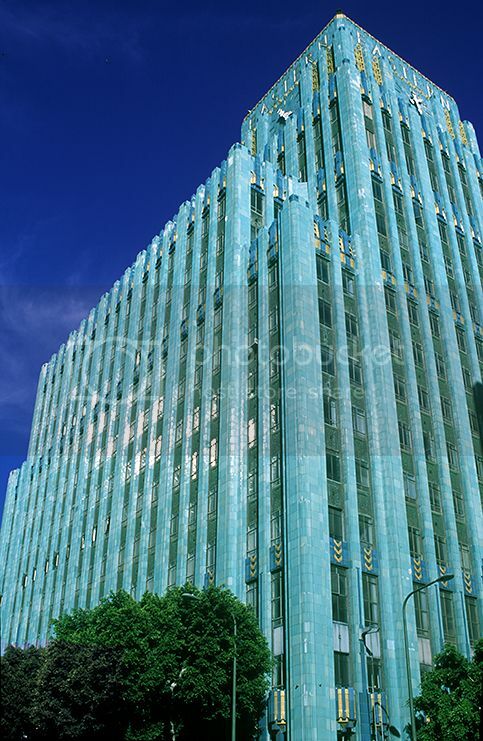 This art deco palace is clad in glossy turquoise terra cotta trimmed with deep blue and gold terra cotta. It is decorated with sunburst patterns, geometric shapes, zig-zags, chevrons and stylized animal and plant forms. It was originally a department store. 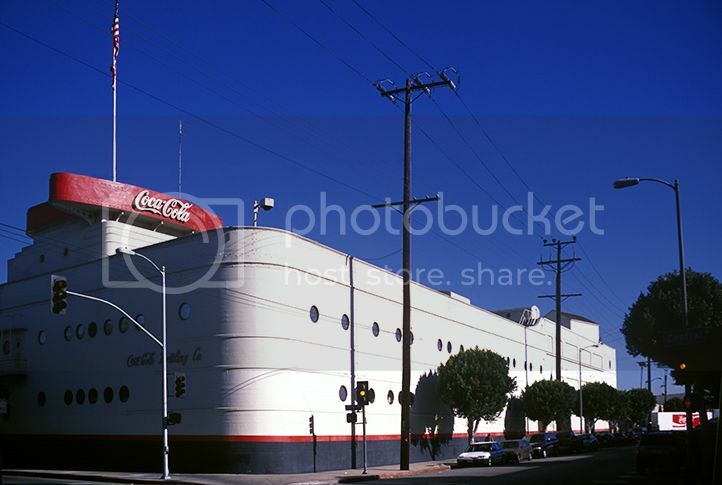 The Streamline Moderne Cocoa Cola Building, 1937, at 1334 S. Central Avenue. Shaped like an 1890s-era ocean liner, this utilitarian structure is complete with porthole windows, ship doors, a promenade deck, catwalk and metal riveting. Thanks for the tour! The atomic pickle sounds delicious. 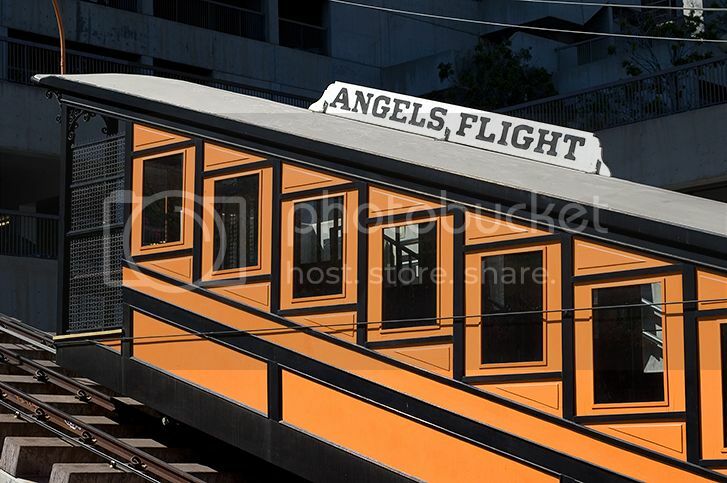 I need to ride Angels Flight before they close it again. 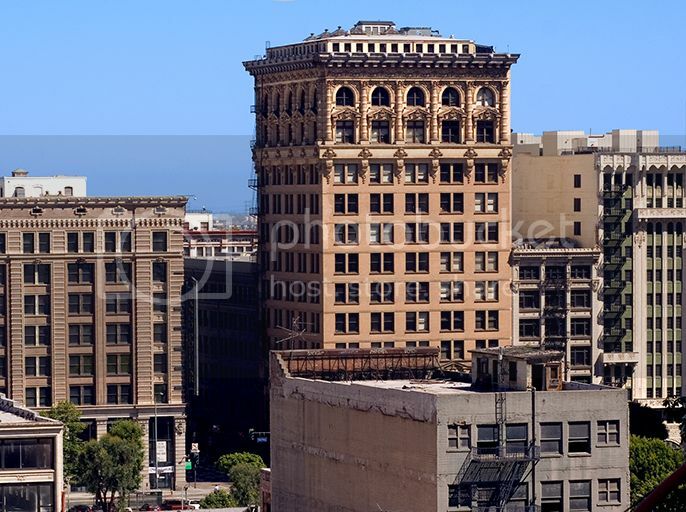 Downtown Los Angeles is a treasure trove of outstanding architecture–this is only an tiny view of what this part of town has to offer. And to eat! I have a report from a reliable source that Sam can be seen in the shot of Loew’s State Theatre, where I worked for a short time. I like this shot because it looks brighter than I remember downtown LA.